This scheme combines a small canal house with a new steel and glass block to accommodate a studio house for a graphic designer. A set-back glazed entrance ties the two portions together. The principal functions are arranged in two layers with the studio on the ground floor and living spaces above. The canal house, a listed building, was dismantled and rebuilt on account of its poor structural and architectural condition. The new block's scale and height lines match those of the existing buildings. 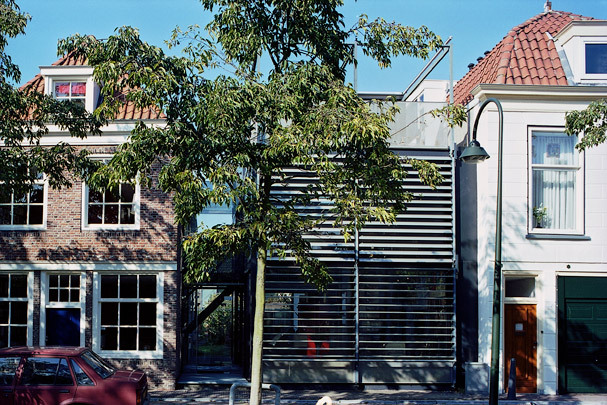 A screen of aluminium slats enables the all-glass facade to be fully opened up or hermetically sealed at will (see also the infill housing in Amsterdam by Claus & Kaan).